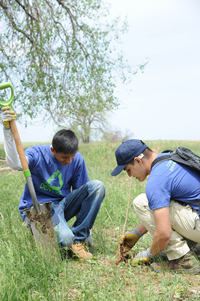 Groundwork Denver has been fighting climate change — specifically in low-income communities in metro Denver — for over 10 years. If the temperature rises as predicted, it will be the community that suffers from the general environmental degradation, food shortages and resulting increased cost-of-living, and economic decline. The health impacts of climate change are likely to fall disproportionately on the poor, the elderly, the disabled, and the uninsured. Our on-the-ground energy action has reduced greenhouse gas emissions by 10,600 tons and has saved low-income families $784,000 on their energy bills. Our transportation programs have reduced greenhouse gases by thousands of tons more and our tree planting and greenspace programs help keep our city cool. As we continue to reduce greenhouse gas emissions by helping people save energy and use alternative transportation, we are also working to help residents be more resilient to climate change impacts. The City of Denver’s Climate Adaptation Plan recognizes increase in temperature and urban heat island effect as a key potential climate change impact for Denver. Extreme heat events can cause a range of health problems including heat stroke and ultimately death. Exposure to extreme heat can also aggravate pre-existing diabetes, respiratory illnesses, and nervous system disorders. Additionally, hot, sunny days can result in an increased rate of ground level ozone formation. Ground-level ozone exposure can cause harmful cardiopulmonary health effects, including shortness of breath and aggravation of lung diseases such as asthma, emphysema, and chronic bronchitis. People living in Denver’s lower income neighborhoods are more vulnerable to extreme heat events because of poor housing infrastructure, fewer trees and parks, less mobility (e.g. fewer cars, inadequate public transportation, poor bike/ped infrastructure) and lower social cohesion. The chart below shows the result of our recent survey of low-income residents of North Denver and Commerce City. We’re working to make our communities more resilient by improving housing infrastructure, implementing green infrastructure, and connecting people to each other and providing emergency preparedness resources.